In his 1644 Principles of Philosophy, Descartes identified freedom with actions that are not pre-determined, even by the existence of divine foreknowledge. Descartes was the origin of the Mind-Body Problem. He famously divided the world into mind (the ideal realm of thoughts) and body (the material world). For him, the physical world was a deterministic machine, but our ideas and thoughts could be free (undetermined) and could change things in the material world (through the pineal gland in the brain, he thought). Here are the relevant sections in Descartes' Principles. 37. The supreme perfection of man is that he acts freely or voluntarily, and it is this which makes him deserve praise or blame. The extremely broad scope of the will is part of its very nature. And it is a supreme perfection in man that he acts voluntarily, that is, freely; this makes him in a special way the author of his actions and deserving of praise for what he does. We do not praise automatons for accurately producing all the movements they were designed to perform, because the production of these movements occurs necessarily. It is the designer who is praised for constructing such carefully-made devices; for in constructing them he acted not out of necessity but freely. By the same principle, when we embrace the truth, our doing so voluntarily is much more to our credit than would be the case if we could not do otherwise. 39. The freedom of the will is self-evident. There is freedom in our will, and that we have power in many cases or withhold our assent at will, is so evident that it must be counted among the first and most common notions that are innate in us. This was obvious earlier on when, in our attempt to doubt everything, we went so far as to make the supposition of some supremely powerful author of our being who was attempting to deceive us in every possible way. For in spite of that supposition, the freedom which we experienced within us was nonetheless so great as to enable us to abstain from believing whatever was not quite certain or fully examined. And what we saw to be beyond doubt even during the period of that supposition is as self-evident and as transparently clear as anything can be. 40. It is also certain that everything was preordained by God. But now that we have come to know God, we perceive in him a power so immeasurable that we regard it as impious to suppose that we could ever do anything which was not already preordained by him. And we can easily get ourselves into great difficulties if we attempt to reconcile this divine preordination with the freedom of our will, or attempt to grasp both these things at once. 41. How to reconcile the freedom of our will with divine preordination. But we shall get out of these difficulties if we remember that our mind is finite, while the power of God is infinite — the power by which he not only knew from eternity whatever is or can be, but also willed it and preordained it. We may attain sufficient knowledge of this power to perceive clearly and distinctly that God possesses it; but we cannot get sufficient grasp of it to see how it leaves the free actions of men undetermined. Nonetheless, we have such close awareness of the freedom and indifference1 which is in us, that there is nothing we can grasp evidently or more perfectly. And it would be absurd, simply because we do not grasp one thing, which we know must by its very nature be beyond our comprehension, to doubt something else of which we have intimate grasp and which we experience within ourselves. 1. 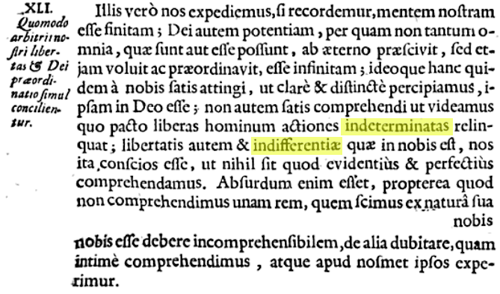 Haldane and Ross translate indifferentiae, perhaps influenced by the liberty of indifference, and by indeterminata in the prior line, as indeterminacy. 42. Although we do not want to go wrong, nevertheless we go wrong by our own will. Now that we know that all our errors depend on the will, it may surprising that we should ever go wrong, since there is no one who wants to go wrong. But there is a great difference between choosing to go wrong and choosing to give one's assent in matters where, as it happens, error is to be found. And although there is in fact no one who expressly wishes to go wrong, there is scarcely anyone who does not often wish to assent to something which, though he does not know it, contains some error. Indeed, precisely because of their eagerness to find the truth, people who do not know the right method of finding it often pass judgement on things of which they lack perception, and this is why they fall into error. If Descartes did equate freedom and indeterminacy with the mind, and determinism with the body, it would anticipate and be consistent with Kant's later view that the realm of freedom is noumenal, where phenomena are determined, for Kant by Newton's deterministic laws of nature.